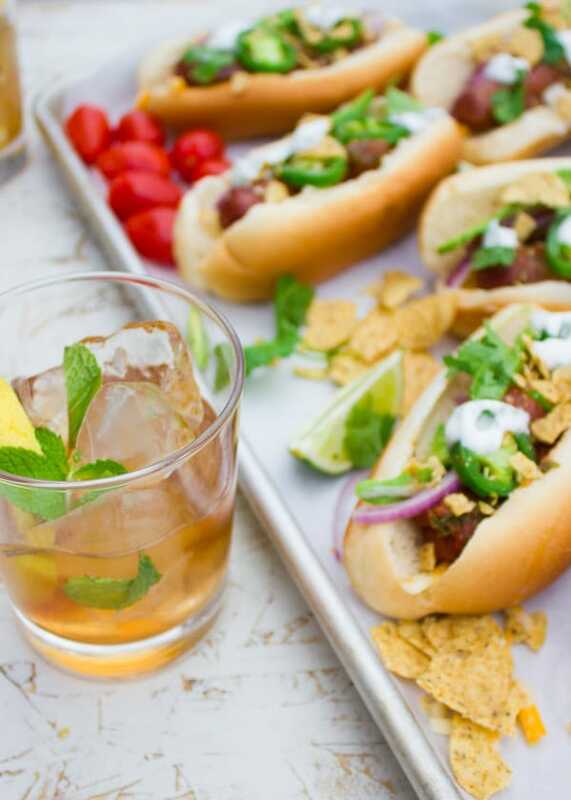 These Grilled Hot Dogs with Nacho Toppings are a perfect cross between succulent grilled hot dogs and a loaded nachos platter! The perfect easy recipe for a summer BBQ Party! 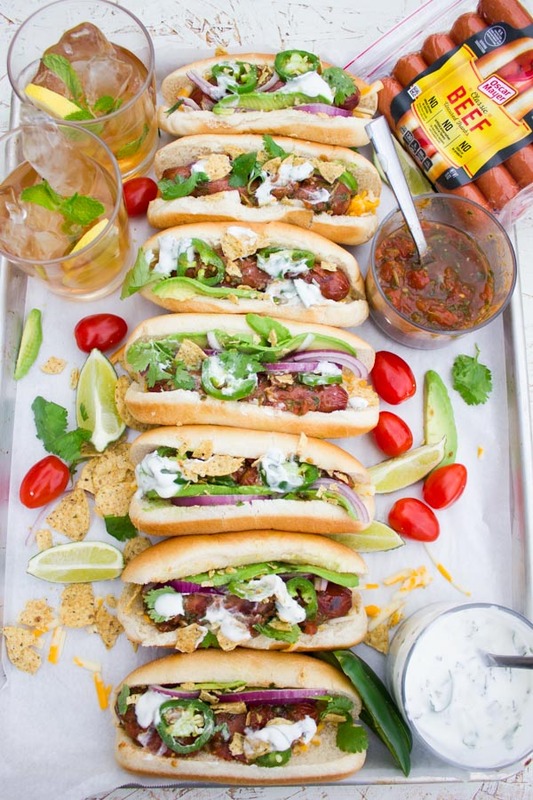 It’s the season for BBQ and Hot Dogs, and these Grilled Hot Dogs Loaded with Nacho Toppings take the crown! 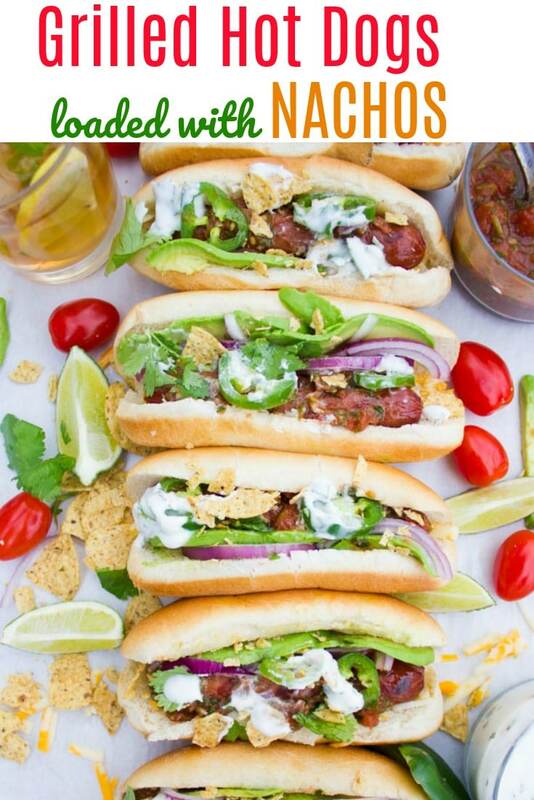 Juicy, flavorful hot dogs prepared on the grill, topped with cheese, salsa, jalapenos, onions, avocados, sour cream sauce, and crushed chips! 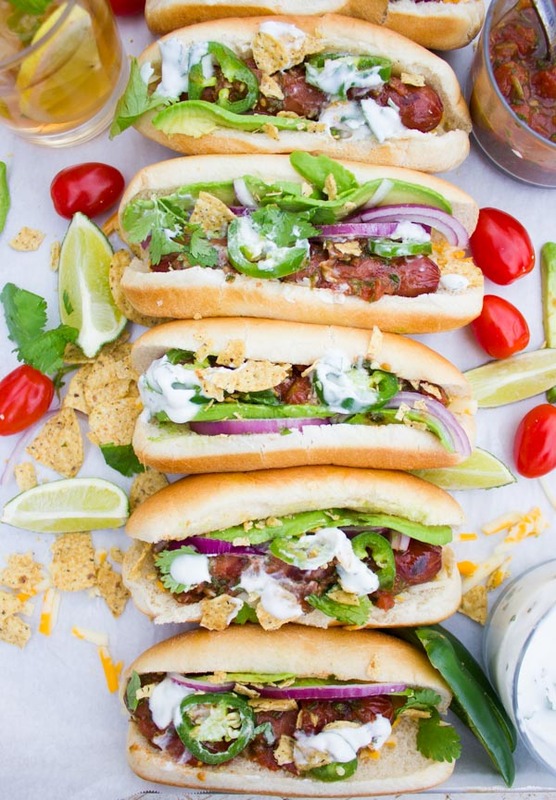 Imagine every single bite of these like a combo of delicious grilled hot dogs, savory cheddar cheese, fiery salsa, smooth avocado, spicy jalapeño, crunchy red onion, tangy sour cream, and crunchy nacho chips! You will wish for this fun meal to never end! I can’t urge you enough to try this Grilled Hot Dogs recipe! Obviously, this is the perfect recipe for lovers of hot dogs and lovers of nachos. So it pretty much includes everyone! Because really – who doesn’t like at least one of those treats?! I love spicy, delicious and flavor-packed recipes like this one! 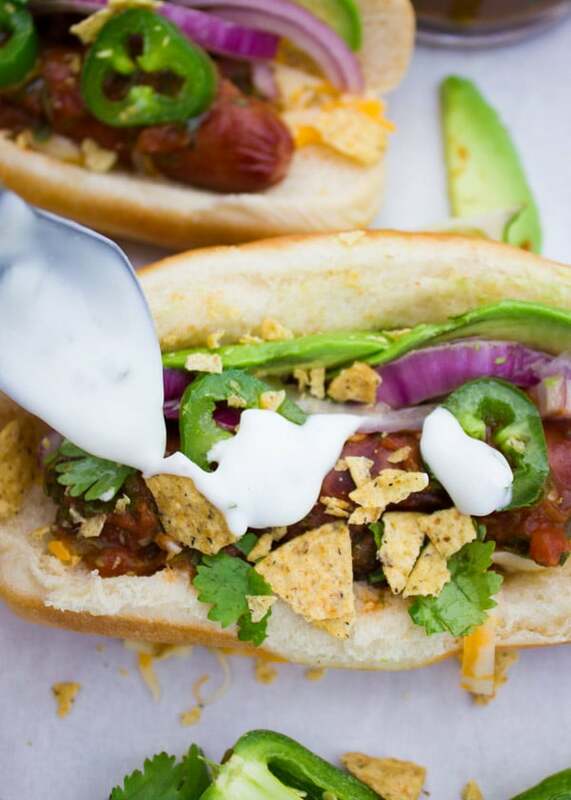 Just looking at the pictures of these Loaded Grilled Hot Dogs with Nacho Toppings makes me wanna go back and fire up the BBQ. Have your toppings ready! Sliced avocados, jalapenos, shredded cheddar cheese, salsa ( I love this Restaurant style Mexican Salsa), tangy sour cream (sour cream, lime juice, salt, and cilantro) and some crushed chips. Start by putting your hot dogs on a medium-high grill and turn them around every couple of minutes until you get the desired level of char. 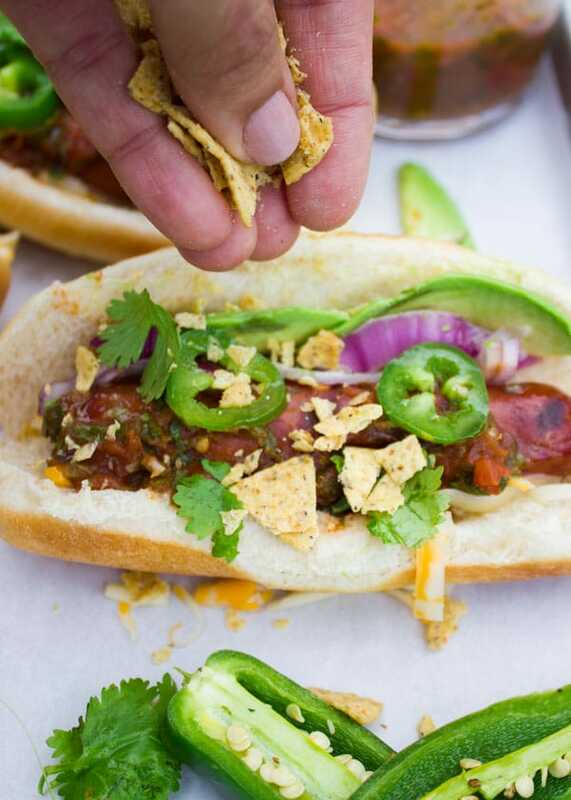 Once the hot dogs are ready, place a handful of grated cheddar cheese at the bottom of your hot dog buns and start piling up the nacho toppings however you prefer. More of this less of that, make it your own perfect Loaded Grilled Hot Dog! Put a grilled hot dog on top of the cheese-stuffed hot dog bun. 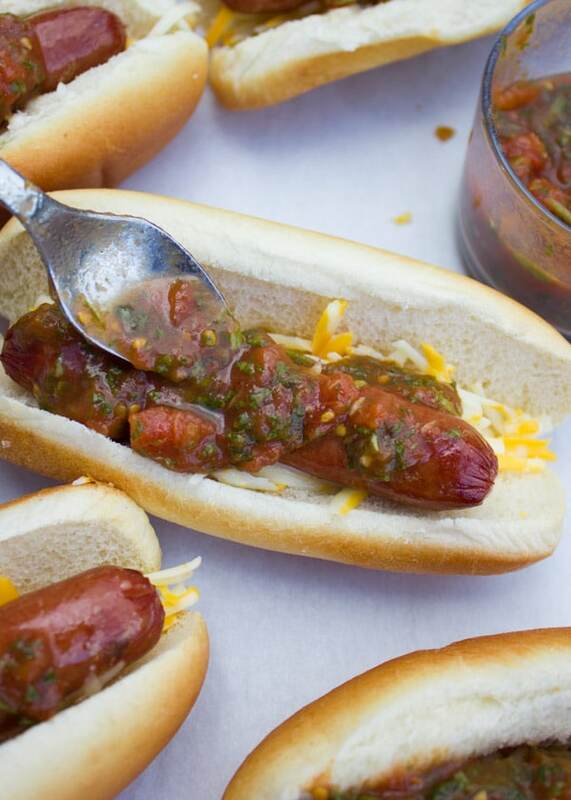 And drizzle a generous serving of salsa on top of your Grilled Hot Dog! 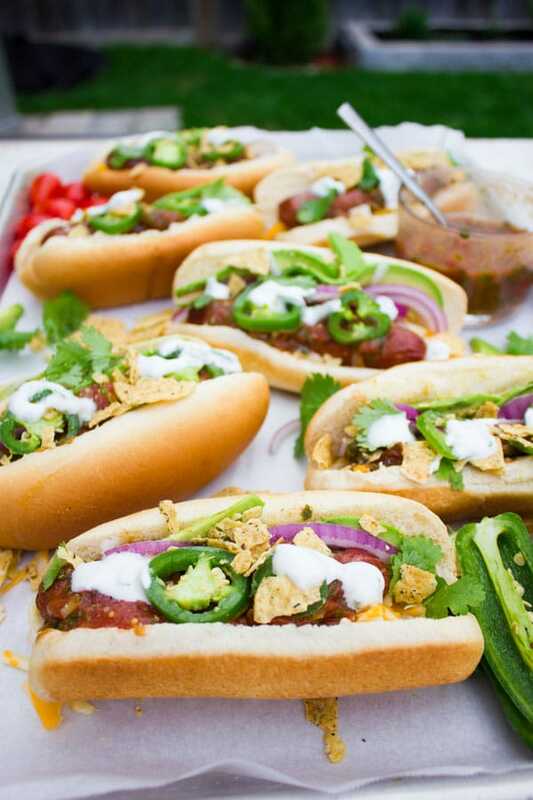 Some chopped jalapenos, crushed nacho chips, sliced red onions and chopped cilantro add the nacho feel to these Grilled Hot Dogs. Top your Loaded Grilled Hot Dogs with some sour cream and you are done! 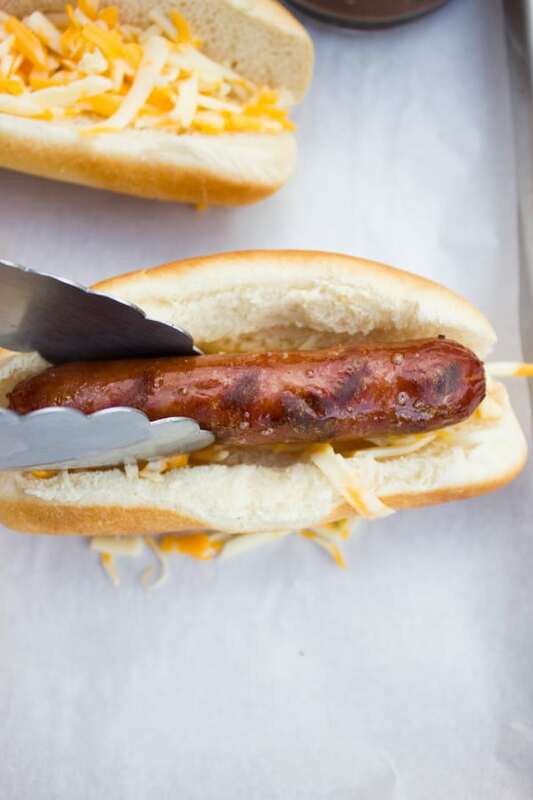 The whole world of delicious game day snacks in one delicious Grilled Hot Dog! 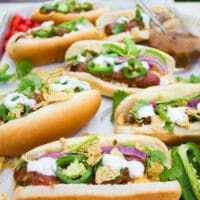 These Grilled Hot Dogs with Nacho Toppings turn out divine following the recipe, but you can totally add in more of your favorite toppings! When I’m having friends over, I like to store the toppings separately in bowls and make a fun Nachos Hot Dog Bar. 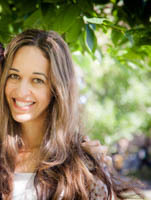 That way, everyone can assemble their own Grilled Hot Dogs and have fun playing around with different hot dog toppings! If your kiddos are eating these hot dogs with you, just remove the jalapeños completely and make sure you keep some of the salsa aside before adding jalapeños to it too. 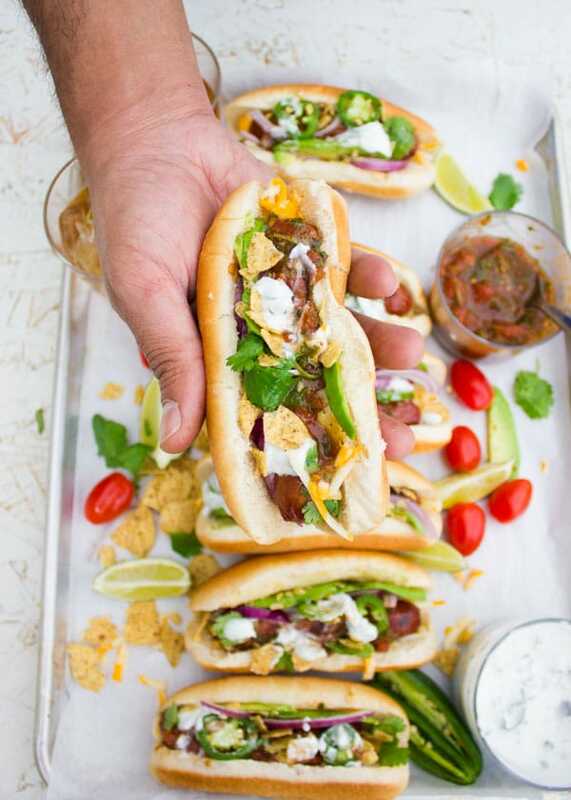 These Grilled Hot Dogs with Nacho Toppings are a perfect cross between succulent grilled hot dogs and a loaded nacho platter! The perfect easy recipe for a summer BBQ Party! 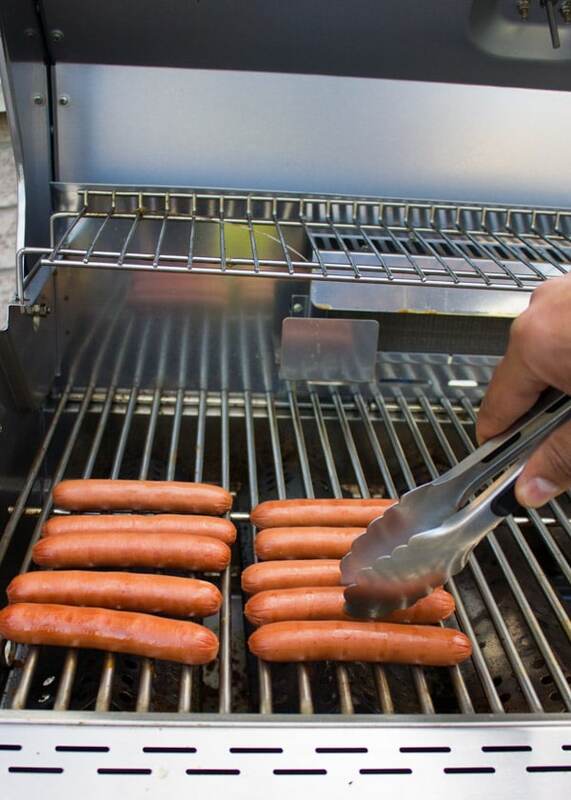 Place the Oscar Mayer hot dogs on the grill and let them cook for 2 minutes before turning them over. Turn the hot dogs and grill them for 2 more minutes, then start swirling them around the grill to get the desired level of char you prefer on your hot dogs. On a large tray, have all your toppings ready in separate bowls. 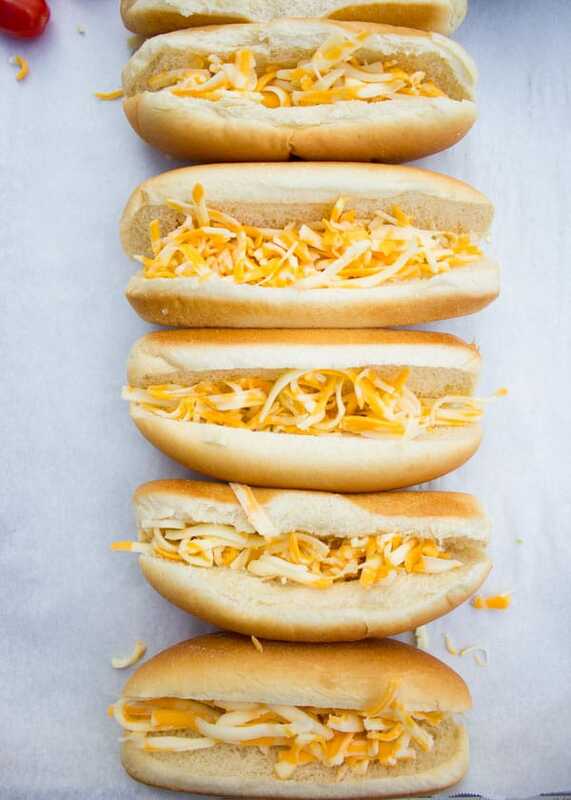 Arrange the hot dog buns on the tray, add a handful of cheese to each hot dog bun. Place the hot dogs over the cheese and it will melt slowly, then start adding the toppings one at a time to your taste and enjoy!